What Do We Know About Death Stranding So Far! Home » Games » What Do We Know About Death Stranding So Far! After his leaving from Konami, the legendary game-maker Hideo Kojima, creator of Metal Gear Solid franchise, has founded a new independent studio Kojima Productions. Along with a new studio, Kojima introduced a brand new IP – Death Stranding – which is… rather mysterious even to this point. If you are fans of Kojima, you already know that he tends to leave tons of secrets and twists even before the game’s official release. 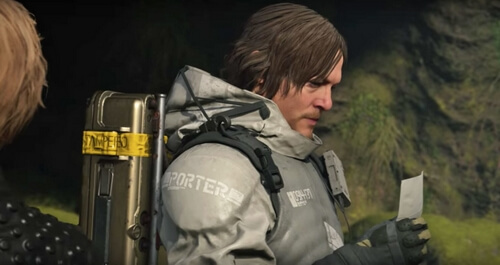 And just like that, Death Stranding is literally shrouded in mystery despite a number of video and trailers presented so far. Nonetheless, this brand new IP from Kojima is a peculiar, yet extremely fascinating one. So with no further ado, let’s check out what do we know about Death Stranding so far! 1. What is Death Stranding? Death Stranding is the brand new IP created by Hideo Kojima and Kojima Productions which was first revealed in E3 2016. 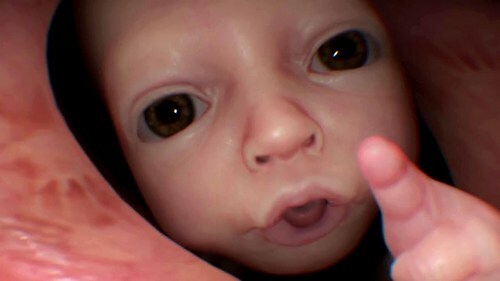 This very first trailer set a weird experience within audiences as it features the famous actor Norman Reedus from The Walking Dead series, a peculiar baby with unknown origin, a literally death stranding of many aquatic creatures, and five monolithic figures from a far. Later on, a number of trailers were showcased, including The Game Awards (TGA) 2016 trailer, TGA 2017 trailer, and the recent E3 2018 trailer. Although they do give further information about the game, the fact that they still do not feature any sort of gameplay nor story makes the game still as mysterious as usual. Many people totally do not like this kind of confusing presentations from Kojima. That said, Kojima fans are so familiar with these sorts of cryptic puzzles, after all, just as he said: “the game has already begun”. 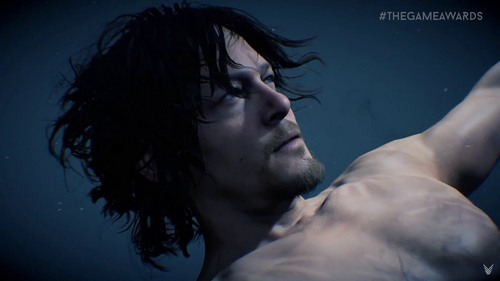 To certain extent, Death Stranding really feels like an interactive movie since it features tons famous movie stars, starting with Norman Reedus, who mostly known playing as Daryl Dixon in The Walking Dead TV series. In this game, he plays as Sam the Bridges Porter who is also the main protagonist. In E3 2018, Kojima showed us a fourth gameplay trailer which is still… rather confusing. Based on the trailer, it seems Sam is a “normal porter” who takes jobs of transporting packages, corpses, or even living human (according to Tokyo Game Show 2018 panel). There are also hints that Sam may also join in combat if necessary. The next famous actor who featured in the TGA 2016 trailer is Mads Mikkelsen who plays as a mysterious commander who leads a troop of skeletal soldiers. At first, many people speculated him to be the main villain of the game; however, he quickly cleared this speculation during Saudi Comic Con 2017 that his character is not necessary a villain nor a hero. Nonetheless, we have to agree that his appearance in the TGA 2016 trailer is really cool. Aside from these two famous actors, we have additional two incredible actresses, both were revealed in E3 2018 trailer: Léa Seydoux and Lindsay Wagner. 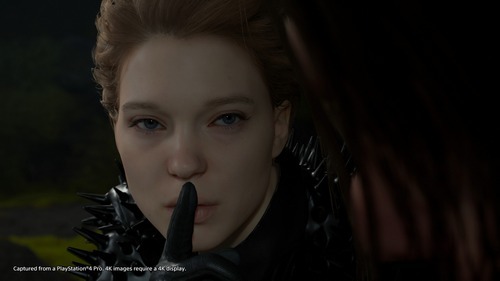 Léa Seydoux appears a lot in the trailer as a mysterious woman who wears a Fragile outfit (possibly represents a faction different from Bridges) and possibly more advanced technologies. She also asked Sam to join her in the trailer, yet Sam refused for some unknown reason. The other female character played by Lindsay Wagner appeared at the end of the trailer, saying that Sam seems to forget about her. Judging from the picture Sam possesses at the beginning of the trailer, it highly notes that Sam and Wagner’s character know each other long time ago. And for some another reason, her character looks much, much younger in the current state. One interesting thing to note is that Lindsay Wagner does not like taking part in violent gaming. 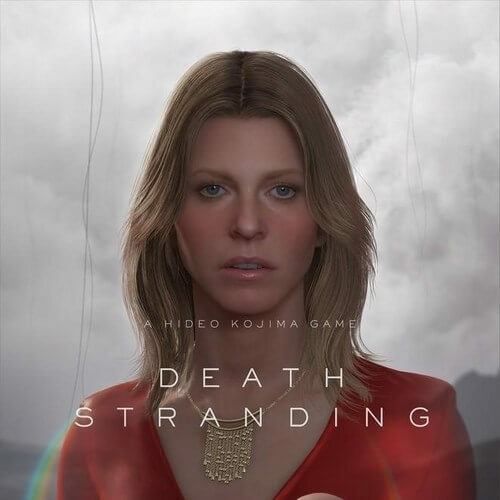 Yet, Kojima managed to invite her in and actually convinced her not only to voice the character in game but also take interest in the game’s concept. This is an exciting news and it further proves that Death Stranding is definitely a joke, but rather, a full-blown game which we just haven’t had opportunity to see it in full yet. If you have watched Death Stranding panel at Tokyo Game Show 2018 just recently, probably you will be a bit disappointed since it was mostly Kojima, Japanese voice actors and actresses sharing some info and experience about the game. But that aside, it did reveal more characters namely Troy Baker, Tommie Earl Jenkins, and possibly Stefanie Joosten? Troy Baker’s character turns out to be the mysterious character appeared in TGA 2017 trailer who suddenly appeared and triggered the monolithic figures and Purgatory entities to attack Sam and his Bridges fellows. Though we haven’t known much about Baker’s character, it seems his character leans more towards antagonistic side. 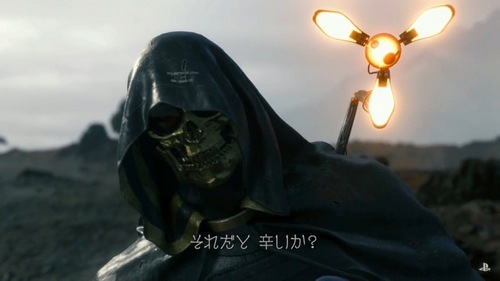 In Tokyo Game Show 2018 video, it showed Baker’s character provoking Sam and summoning a monster made of black liquid wearing golden mask. The other character played by Tommie Earl Jenkins is introduced to be the boss the company which Sam is working for. 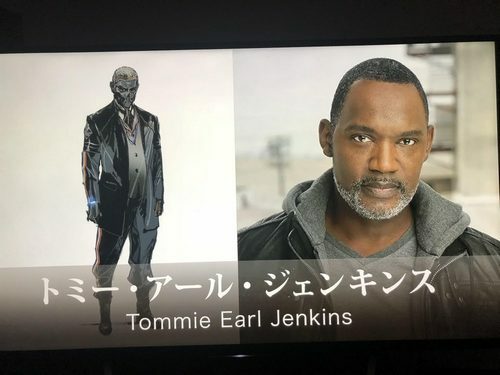 Based on his character’s concept art, this character wears a black suit and a skull-like mask, but that’s all we know about the guy. In addition, there is a slight hint indicating that Stefanie Joosten also joins the project with her 3D model showing in the video. In fact, Stefanie’s manager did have a confirmation post on his Twitter. And of course, her character’s detail is still unknown. 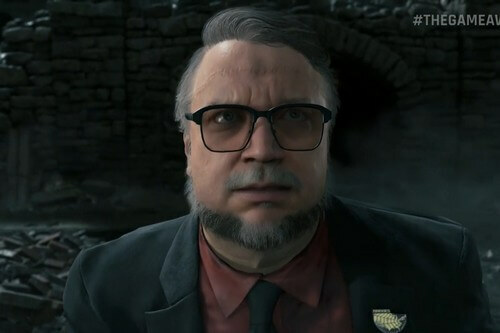 Finally we have concept art of Guillermo Del Toro’s character who is unfortunately not played by Del Toro himself but rather, has his physical 3D model. And other actor will play as this character. According to IGN’s interview with Kojima in 2016, one of the main themes in Death Stranding is about Stick and Rope. As Kojima explained, Stick and Rope are the two most ancient tools used by mankind; each represents a certain aspect in human’s life. The Stick is used to drive the threats away, while the Rope is used to secure and connect things which are important to people. Kojima further explains that in most action games, players are given the Stick, which means weapons in order to defeat enemies. On the other hand, while Death Stranding is an action game, Kojima wants it to be something different, something which has never been explored before. Specifically, Death Stranding will focus more on the Rope element. Players can also the Stick; however, it will be less encouraged in this game. Overall, this theme sounds really fascinating and we’re really curious of how it will be implemented in game. 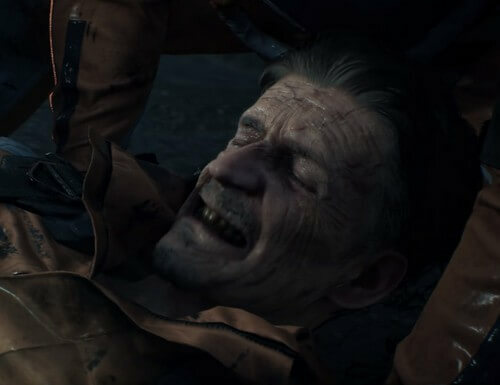 There are possibly lots of gameplay elements in Death Stranding, but here we will only list some of the most significant ones showcased in the trailers. 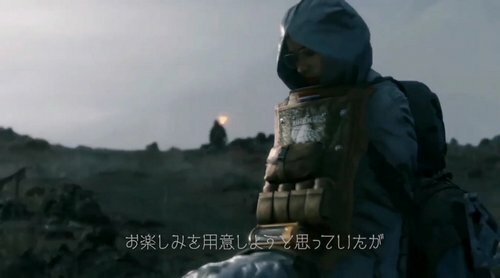 Timefall seems to be prominent phenomena in Death Stranding. In short, Timefall is a type of rain which will accelerate the time progress in extremely fast pace. If we take a look at the TGA 2017 trailer, we will see that flowers and grasses on the ground quickly rise and die in mere seconds. Organic beings, like human in particular, will age in extreme rate, for example, a young person will quickly become an old man in few seconds, and no doubt, that person will die soon due to old age. In E3 2018 gameplay trailer, it further implies that the only way to prevent Timefall from affecting a person is to wear a full-body suit which covers the head (like the Bridges suit wore by Sam), or in case of Léa Seydoux’s character, having a special umbrella which can create force field covering her surroundings area. Another method to prevent Timefall is to consume a creature known as “water bear” which can prevent Timefall’s effect for a day, according to Léa Seydoux’s character. 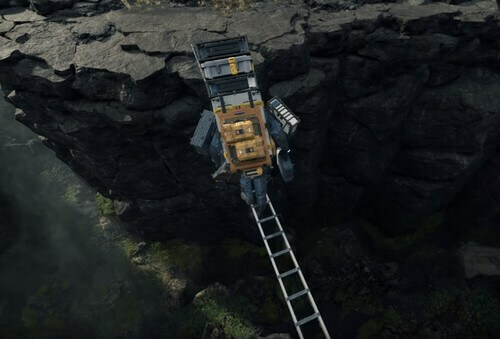 One fascinating element in Death Stranding is that there will be no “game over”. As we discussed, when Sam dies, he will fall into a Purgatory water world where the baby will reside within his body. Plus, in this purgatory world, the players will seem to control Sam in first person perspective and explore the surroundings. Here, players will be able to retrieve lost items and more importantly, Sam’s body in order to live again. Every time he dies, Sam will have additional handprint on his body, seemingly indicates the number of deaths. And to even more surprise, Sam’s death will not pause the game. 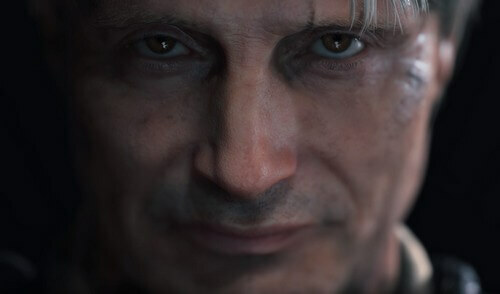 After his death, the world of Death Stranding will still keep on progressing. For example: in TGA 2017 trailer, after Sam resurrects from his death due to the explosion caused by the gigantic alien-like entity, he will see a huge crater caused by the explosion. And depending on how player will mess up, the world may be filled with tons of those craters. Despite not showing much of the gameplay, the E3 2018 trailer did show a huge part of Sam’s job being a delivery guy. In the trailer we saw Sam carrying packages and even body from places to places. Also, one important thing to note is that Sam is just a normal person. Therefore, he will struggle with lots of natural obstacles like strong river flow, rain, mountains, etc… In addition, there will be no HUD indicating Sam’s health; instead, it will be indicated by the glowing handcuffs on one of Sam’s arm. Blue color indicates full health, then lowered to yellow/orange, and finally red which indicates near-death state. Another important element is stealth, which seems to be pretty intense judging by the trailer. Near the end of the E3 2018 trailer, we saw Sam surrounded by the spectral entities. And so, he decided to connect with the baby via an artificial umbilical cord. This activated the mechanical arm on Sam’s back to detect those entities easier. Next, we saw Sam crawl through an open area filled with those spectral entities. But once he was found by one of them, tons of them will immediately grab Sam and pull him into what we can guess as the purgatory world. 2.4. When Will It Be Released? Honestly we still don’t know the game’s release date at this point. All we can guess is that the game can possibly be released on mid-late 2019 or maybe even early 2020. Development-wise, the game’s production first began in 2015 after Kojima left Konami and reformed Kojima Productions as an independent studio. We also know that it worked with Sony to release a brand new IP and in 2016; we knew that it was Death Stranding. According to various interview with Kojima, he constantly said that the game is in good development pace. In Tokyo Game Show 2018, he also said that it was a bit difficult at first in terms of finding the right cast, especially in case of Norman Reedus and Mads Mikkelsen. 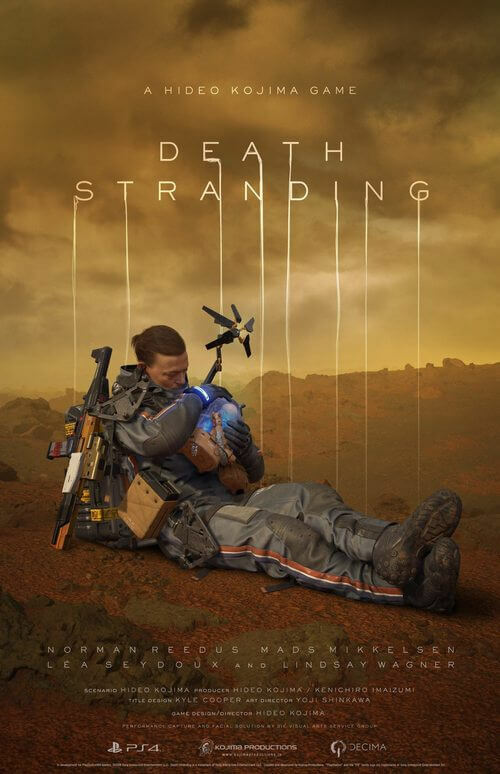 In any case, even Sony expressed that they have never seen any game in development as fast as Death Stranding. There is also a high possibility that Kojima actually had a clear picture of this game long before 2015 and now he could finally bring it to reality. And if that’s true, plus the great development progress, 2019 release date may not be that far-fetch after all. *Note: This is only speculation and there is high possibility that it is entirely wrong. 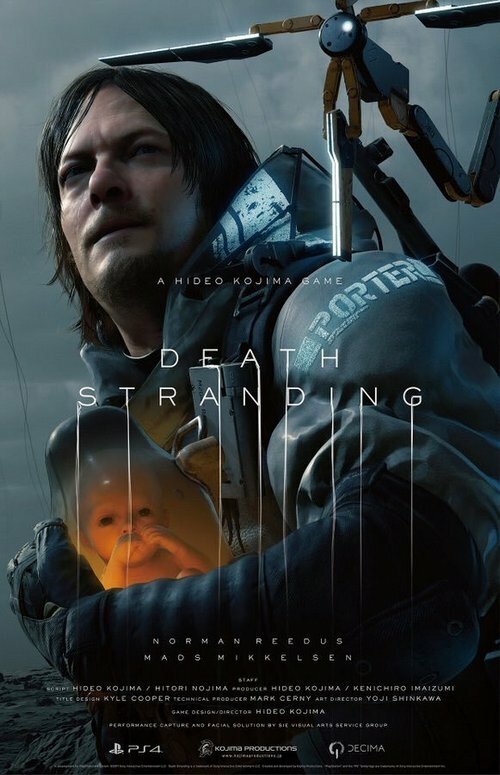 There are many theories out there regarding the overall theme and the story of Death Stranding. However, here we will only include the seemingly most viable one, including some of our personal twists and opinions. So before we get into the detail, we would like to give our thanks to PythonSelkanHD who had a fantastic theory about the game (also if you like to hear more analysis/theories about Death Stranding or Metal Gear Solid franchise, please check out their awesome channel). 3.1. Sam’s path of atonement? Instead of explain their theory in details; we will only sum up its main idea. 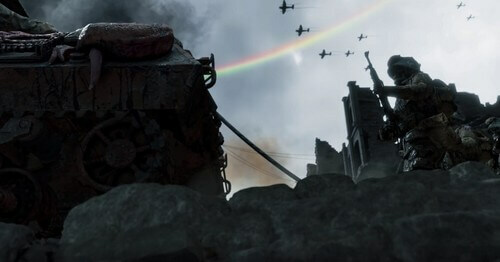 In short, Python and Selkan proposed an idea that one of Death Stranding’s themes, especially relating to the main protagonist Sam, is atonement. Pay attention to Léa Seydoux’s dialogue when talking to Sam in E3 2018 trailer, she said that: “The Timefall fast-forwards whatever it touches, but it can’t wash everything away. The past won’t just let go.” This highly indicates that it seems Sam has a darker history than we thought, possibly sinful. The quote “the past won’t just let it go” strongly implies that there was certain event in the past which Sam may want to forget. Such event will keep haunting Sam and clearly it is not a happy one. This led to a theory that Sam used to do something terribly wrong, or accidentally do something which he terribly regrets later on. The picture Sam holding showed a pregnant woman (who is likely to be Sam’s wife) standing beside him and Lindsey Wagner’s character who stands right behind both of Sam and the woman. If we look closely at the background, it looks extremely like President’s office place in the White House. 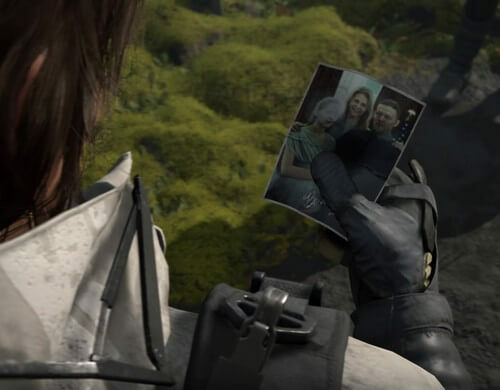 Obviously Sam has a close connection with Wagner’s character, especially at the end of the trailer when her younger version said Sam seems to forget her. Maybe Sam did something horrible which caused his wife’s death? 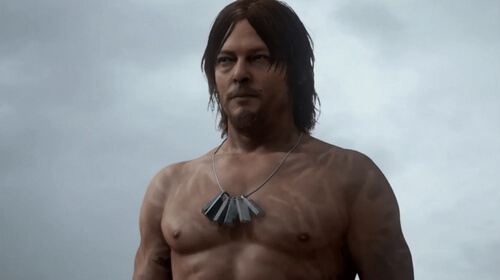 Or did he do something which triggered the weird phenomena happening in the world of Death Stranding? We’re not sure, but if it’s true then the gameplay we saw in the trailer will actually make more sense. 3.2. Death Stranding – the Path of Redemption for Mankind? 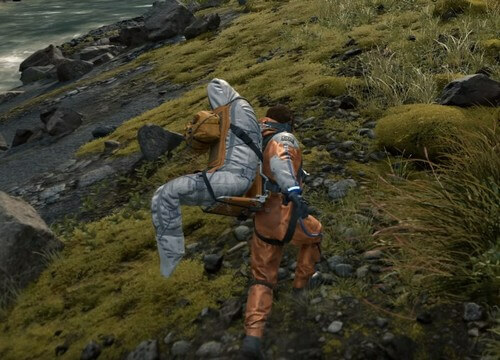 One of the things which makes us feel extremely interested in Death Stranding is how it connects Science and Spirituality. It brings up various elements from both science and spirituality, specifically the “quantum physics” and “purgatory” aspect. So how do these two aspects related to all of this? Here’s the thing: we can safely assume that the world in Death Stranding is in turmoil state. 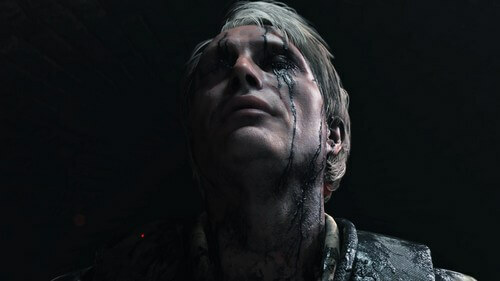 It seems to be broken, fractured due to the phenomenon called as “Death Stranding”. More specifically, the living world is now being “flooded” with the world of the dead. The water from the Purgatory leaked into the world of the living, resulting in the invisible creatures which seeks and drowns the livings into the Purgatory world. But what caused this phenomenon? Personally, we believed that it has something to do with the sin of humankind. 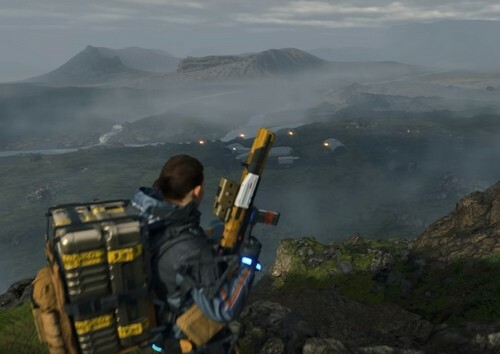 Possibly Death Stranding is set in a future Earth where humankind has accidently damaged the Earth to the point of near-extinction. And maybe for some reason, scientists try to find a cure from the outside world, specifically the parallel realms. Yet unfortunately, they failed to comprehend the threat and ultimate let the Purgatory world and entities from different dimensions “stranded” to Earth. This caused Earth to be even more broken, thus leading to major changes in many countries, for example: the United States of America becomes the “United Cities of America”. The game itself possibly represents the final chance for humankind to truly change, to be more specific, redeem themselves. As we established in previous section: Purgatory means “purification to be able to get to Heaven”. Combining with the theme of Stick and Rope, it seems Sam is walking on a path of redemption, not just for himself but also for mankind. Like Kojima said: players can use the Stick, but it is more encouraged to use the Rope. That means: the players/Sam can “win the game” without using brutal force like weapons. By using the Rope, which represents connection, for Sam, his redemption is maybe to mend the world by connecting people through his delivery work. 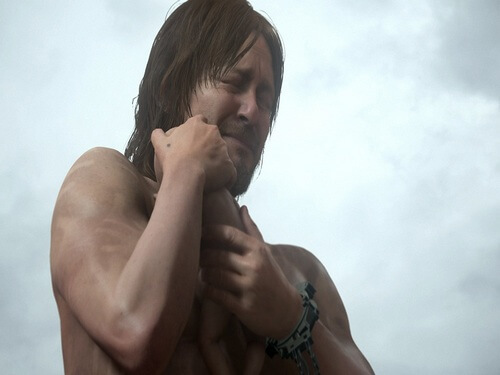 By connecting people together by true peace and love, humankind can finally survive this cataclysmic event called as “Death Stranding” and possibly evolve to higher state. However, not everyone in this world thinks of this way, typically Mads Mikkelsen’s character. Judging by Mikkelsen’s explanation and his character presentation, it seems he seeks to mend the world via the mean of violence, or the Stick. His plan involves using dead WWII soldiers who somehow comes back to life in the form of skeletons. From this perspective, it is truly difficult to claim Mads Mikkelsen’s character to be a villain since his ultimately goal is actually good. It’s just that his method is different from Sam, or other human entities. Furthermore, this theory seems to put the players/Sam in a moral-gray state in which there is no right or wrong. Different people are finding different ways to save the world, and each of them has their own reason. But anyway, that’s just our speculation. And what about you? What do you think about Death Stranding? Feel free to share with us and for now, thank you and stay tune for more news in the future! Guide to become Spiderman: Marvel Spider Man PS4 Tips and Tricks! The New Battle Royale Contender: What Makes Apex Legends Great?